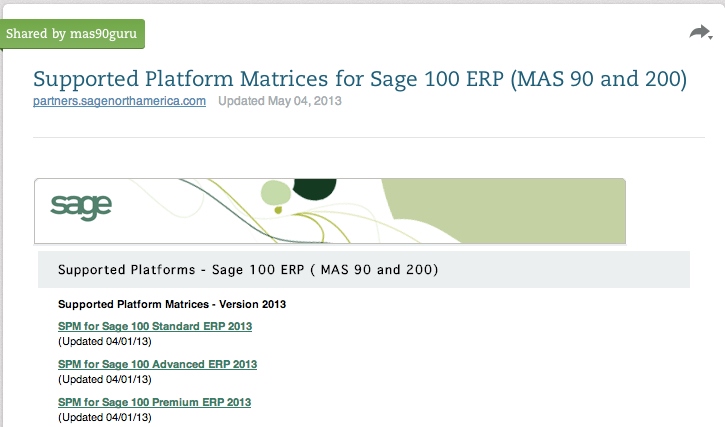 Version 4.3 of Sage 100 ERP (formerly MAS90 and MAS200) will no longer be supported. This means those on version 4.3 (or earlier) will not get access to any product updates which might fix bugs or ensure compatibility with Microsoft releases of Windows 8+. Also please remember that Sage will no longer issue payroll tax form updates for any version of Sage 100 ERP and instead you will use the included Aatrix tax functionality to print forms which is only available for supported versions of Sage 100. What Does The Low Speed Connection Option Do In Sage 100 ERP Advanced – fka MAS 200? This is a holdover from earlier MAS 200. Here’s what it does. In most cases due to improving connection speeds it should no longer be needed. It was invented in Level 3.early and was originally intended for remote people running MAS 200 from slow dial-up or ISDN connections, particularly if they ran over a VPN. Some people called in saying when they were in S/O Entry and clicking on Next number button sometimes resulted in the screen hanging or an Error 14. What happens in MAS is by design the screen loads first and the code behind it loads 2nd. Normally this all happens in a blip and you never notice. But on a low speed remote connection (or even a medium to high speed connection shared by too many people ergo bandwidth / user severely reduced), the delay between screen load (aka form load) and UI code is more pronounced. IOW the Error 14 when clicking Next # button was cuz they didn’t wait another second or 2 after S/O Entry appeared. So if you turn on Low Speed Connection, now when you open S/O Entry, you see this strange red box appear in front of the screen. To use a geek term it’s a modal window but w/o an okay button. It won’t let you click anywhere on the S/O Entry screen until the code behind it is fully loaded. Then the strange box goes away. If you’ve ever encountered an issue with Sage 100 ERP having and issue and you suspect that a system file (user names, company master file, etc) could be at fault then you probably already know that there is a hidden utility to help you rebuild those files. Rebuild system file(s) with SVXBLD. Double-click PVXWIN32.EXE (or right-click the file and select ‘Open’). Click the ‘Ok’ button on the splash screen. A blank screen with a ‘Greater Than’ ( > ) prompt should appear. Type RUN “SVXBLD” (with the quotes) and press ‘Enter’. SVXBLD should open. Get all users out of Sage ERP MAS 90 or MAS 200. (And for MAS 200, the Service or Application must be stopped). Via Windows Explorer, access the live “..\MAS90\Home” directory on the server where MAS 90 or 200 is installed. Double-click on the Pvxwin32.exe program to access a command line window. At the User Logon prompt, enter your user logon and password. Once past the warning prompt, a Rebuild Key Files window will appear, displaying the available system files that can be rebuilt. Use UFAR as a last resort after other methods have failed to restore or repair the file. No log file is created and it is impossible to determine what records are deleted. If rebuilding a ‘non-system’ file the path is required. At the prompt for the temporary file name, accept the default backup name (for example: Sy0ctl.b00), and press ENTER. At the “Recover for Highest Active Index or Physical End of Record” message, select the desired option and press ENTER. Using the cursor keys select ‘D Wrong’ then select ‘E Wrong’ then select Yes and Yes again. Type BYE to return to the command prompt. One of the most common misconceptions about ERP software upgrades is that you can simply take the upgrade disk, load the automated setup program and magically be upgraded to the latest version with minimal advance preparation. 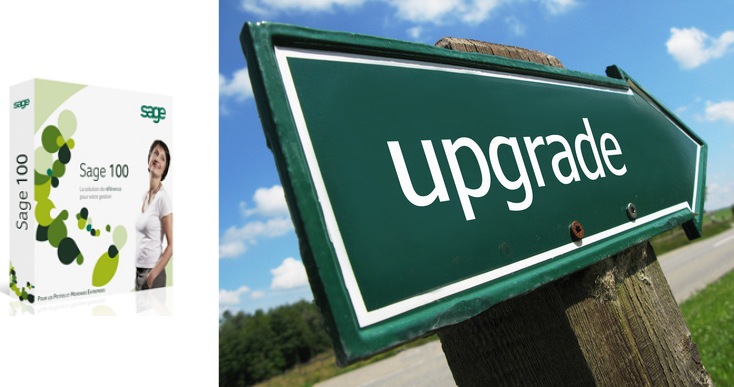 While this may be true in some cases we’ve found that in almost all upgrades of Sage 100 ERP 2013 you will want to consider some critical items before you begin your upgrade. If any of them seem foreign to you or you’re not sure what they mean then it’s a good idea to contact your Sage Business Partner. 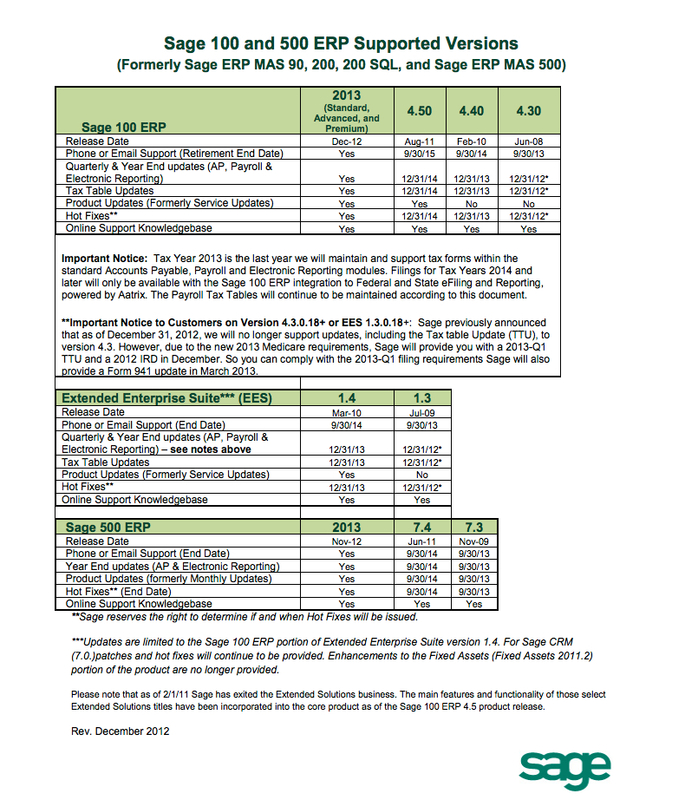 What’s New In Sage 100 ERP 2013? Often users will ask “what’s new” in their upgrade. 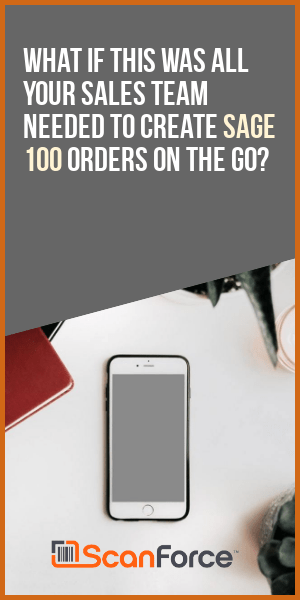 The answer to this question can be found at the following Sage Upgrade Guide PDF – http://goo.gl/bu0mi or online via http://services.sagesoftwareinc.com/mas/whatsnew/. 1. Beginning in late 2013 all tax forms will require access to the included Sage e-Filing solution. Access to e-Filing requires that you have the latest registration codes with your current Sage account number. 2. The reason to have Sage validate them is that if the client has not had any changes to their account since Atlas (new Sage Portal containing a list of products owned by each customer and their registration keys) went live in 2012, the keys on the Portal may be old and not work. Access the Sage portal via http://na.sage.com/Log-On and navigate to your company information to obtain updated registration keys. If you are using v4.3 or earlier of Sage 100 ERP (formerly Sage ERP MAS90 or MAS200) and also have Extended Solutions installed then you’ll need to either insure those solutions were incorporated to Sage 100 ERP 2013 – or purchase the solution from a 3rd party developer. Sage discontinued selling Extended Solutions after v4.30 and turned future development of some over to third party developers and incorporated others into the core product functionality of future Sage 100 ERP releases. If you have questions on whether your Extended Solutions were incorporated check with your Sage Business Partner. Same general concept for any third party programs (Example: Starship, EDI, Job Ops). These enhancements likely require upgraded versions to work with Sage 100 ERP 2013. Contact the software developer of your third party solution for advice on whether an upgrade is needed. For Extended Solutions you can contact your Sage Partner or a Sage Master Developer and inquire about whether the enhancement is available. Remember some Extended Solutions were added to the Sage 100 ERP core product so you could find that an Extended Solution you are using (example – Positive Pay) does not need to be upgraded because it is now part of the core program. Midway through the migration process you’re going to be stopped and warned that conversion can’t proceed without the modules that existed previously. Therefore you should uninstall any module or add-on that is not actively being used. a) Uninstall the unused enhancements from your live company. b) Perform upgrades from a copy of the live system, not the original. Uninstall the enhancements from the copy, not the live system. Many times, enhancements may not function as they previously did, and without access to the original installation, troubleshooting becomes extremely difficult. 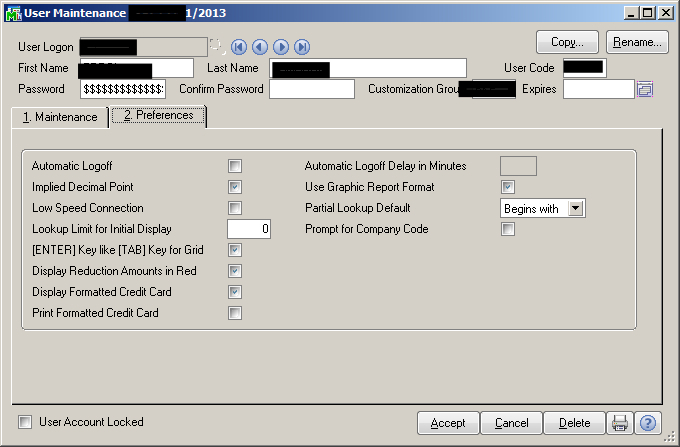 #4 Determine if using integrated credit card processing or if currently storing credit card data in Sage 100. Migration related to credit cards can be extremely lengthy, even if not using integrated credit card processing and only just storing credit card data in Sage 100. There’s a process/utility for determining how long the migration is expected to take. Otherwise it may be recommended to first get rid of all Sage 100 credit card data (i.e., reinitializing the applicable credit card related data files) – if it’s not truly needed to retain that data. PS – Beginning with Sage 100 ERP 2013 the only integrated credit card processor supported is Sage Payment Solutions. The use of PC Charge is no longer supported by Sage which also means that you may be required to change processors. If this impacts you then stop your upgrade and talk about your options with your Sage partner. To prevent automatically installing an update or anything prematurely, especially if there’s modifications / enhancements installed. Verify that the option within Sage Advisor regarding automatic updates is set to download only and NOT to download and apply. #6 If You are installing to Windows 2008 R2 Server Remotely – Run Everything As Administrator (Right Click – Run as Administrator). Run Workstation Setups from Autorun. There are some security features in Windows 2008 R2 which seem to require that Sage 100 ERP be run as administrator (provided you are on the server or remotely connected to the server via RDP, etc). You can also right click the Sage 100 ERP icon and select properties and compatibility and there’s a checkbox to automatically run as administrator. Also you may need to turn off Data Execution Prevention (Start – Control Panel – System – Advanced – Performance – Settings – Data Execution Prevention) for Launch32.exe and/or Pvxwin32.exe. Use caution with system changes. For more information about Hyper-V see – Wikipedia . Some users have noted that their Sage 100 ERP systems run very slowly in a Hyper-V (virtual server) environment. This can also result in errors which may at first glance appear to be connectivity related. Configuration of Hyper-V allows an administrator to specify the number of processing cores to allocate. In many cases if only one core is specified then you may notice performance related issues. If you can allocate 4 cores these issues may resolve themselves. Some upgrades to Sage 100 ERP 2013 will also involve custom Accounts Payable check forms. If you open the form and attempt a “Database – Verify Database” you may be greeted with the error “U25Store.dll that implements this function is missing”. This is because Sage and/or Crystal changed some functions. Running MASCRCW will NOT update function changes (only fields). Instead you must manually change the AP check form. Note that this should only be an issue with migrated custom Accounts Payable check forms. The above formulas are copied/pasted from a generic Accounts Payable check (Standard). #9 FRx Reports CAN be converted to Sage Intelligence. c. RenovoFYI – Offered by some ex-employees of FRX. Claim to convert about 90% of existing FRX report layouts for a fixed fee of about $800. Good choice for anyone using FRX and happy with no desire to create Excel based reports. Create Sage Intelligence reports using the Report Designer add on. Starting with Sage 100 ERP 2013 installation must happen at the server. This has to do with the installation routine and helps make future updates easier. Be careful because during installation the system might prompt you to install some Microsoft prerequisites. And those prerequisites may require a system reboot of which the only option displayed will be “Ok”. Often it is not convenient to reboot midday on an active server. After you’ve installed you can click the Sage Advisor button in the task tray (lower right) to check for product updates. Upon approval you can automatically install the latest product update (PU). # 11 Will Sage 100 ERP 2013 Run on XXXXX Operating System or Hardware? Before installing the latest Sage 100 ERP upgrade many users will also be updating servers and workstations and possibly operating systems. Invariably the question arises of which operating systems and servers/workstations are supported by Sage. Because this list is subject to change it’s always easiest to download the latest supported hardware and operating systems directly from the Sage Software site. Sage only supports the operating system and hardware published periodically in a document referred to as the “Supported Platforms Matrix”. There is one document for each version (or ranges of versions) which contains the environments tested and certified by Sage as compatible with their ERP system. Click this link to view a page where you can select your version of Sage 100 ERP and view the supported platforms. If you are upgrading Sage 100 ERP 2013 or 2014 to Windows XP workstations be advised that these workstations must have SP3 loaded. Because this can take some time to install you may want to check the workstations several days before the date of your upgrade. Need Assistance With Your Sage 100 ERP Upgrade? Sage issues regular updates to their listing of the supported servers , operating systems and hardware tested and trusted to work as platforms for Sage 100 ERP (formerly Sage ERP MAS 90 and MAS 200). Since these documents are subject to periodic update we recommend that you download a copy of the Sage Supported Platforms Matrix for review immediately prior to making any purchase of new hardware or operating systems upon which Sage 100 ERP will run.